The HC-X1 is a professional handheld camcorder equipped with a newly designed LEICA DICOMAR 4K Lens featuring a wide 24mm angle and optical 20x zoom as well as an effective 1.0-type (inch) high-sensitivity MOS sensor. It has the mobility to shift your video production to professional 4K images. 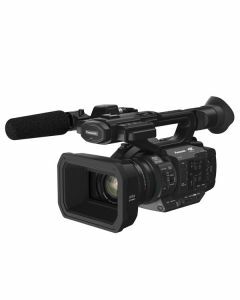 The light, compact Panasonic HC-X1 4K camcorder professional comfortably handles 4K 24p, UHD 60p/50p, FHD 60p/50p multi-format recording and HD super slow-motion. Additionally, the camera includes a wide 24mm angle Leica Dicomar 4K Lens 20x zoom. This innovative premium Leica Dicomar 24mm 4K Lens provides 24mm at its wide-angle setting with essentially no distortion. An ideal option for shooting in confined and narrow spaces. As standard the HC-X1 offers a 4-Drive Lens System that concurrently and independently supports four lens groups (group 2, iris, group 3, group 4). Lens size and drive range for each of the four groups can be effectively suppressed to augment image quality and zoom power. By utilising hand-shake correction that pairs the effects of both optical and electronic image stabilization in HD shooting modes, the HC-X1 detects and corrects hand-shake in various directions, including roll rotation. The optical 20X zoom lens covers the range from 24mm wide-angle to 480mm telescopic and the lens can speedily zoom from wide-angle to telescopic.